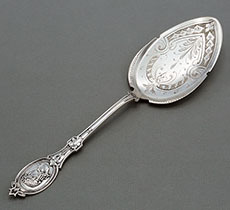 A coin silver engraved antique pie server by Hotchkiss & Schreuder with a medallion at the terminal and deep fine engraving on the blade. Circa 1860. Length 10". Weight 2.90 troy ounces. 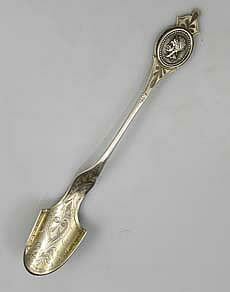 A pristine Gorham sterling silver medallion pattern spoon measuring 9" with a weight of 2.2 toz. In the original fitted box which is in two parts because the hinge has split. 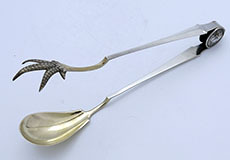 A large pair of Gorham antique sterling silver serving tongs with medallion handles and long arms terminating in a bowl and a chicken claw. Gold washed bowl and tines. Perfect condition with excellent spring. Length 11 1/2". Weight 5.9 toz. 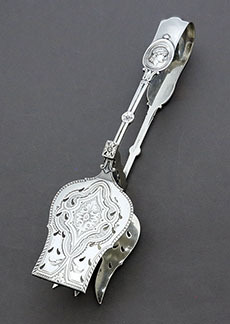 A large John Wendt medallion pattern sandwich tongs with finely engraved blades and a lovely crest on the outside curve of the handle. Both blades are pierced as well as engraved on the outside. Length 10 1/4". Weight 7.8 toz. 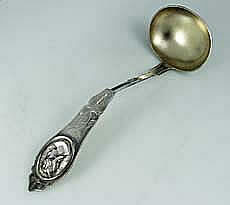 A fine quality coin silver ice spoon with pierced bowl and an applied mask at the terminal. Gold washed bowl and applied beaded edge at the top and on the center of the handle. 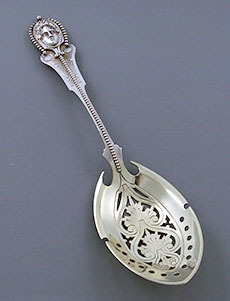 Engraved highlights on the handle and around the piercing in the bowl. Length 9 1/4". Weight 3 troy ounces. A Wood & Hughes coin silver flat server with medallion on the handle and engine turned with bright cut decoration on the gilded blade. Length 9 7/8'. Marked W & H. Good condition and never monogrammed. 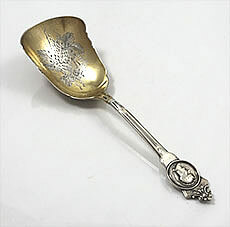 A sterling silver macaroni server by Hotchkiss & Shreuder circa 1870 with a fluted bowl engraved with acorns and leaves. Monogrammed on the reverse of the handle. 9 1/8". Weight 2.65 troy ounces. 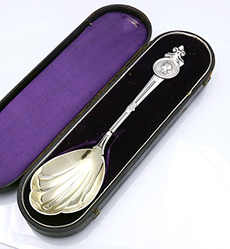 A coin silver fruit server in the form of a scoop with a medallion on the handle and engraved floral bowl. Never monogrammed. 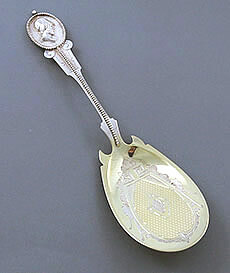 A coin silver cheese scoop with an applied medallion head against a stippled background. The handle is hand engraved as is the gold washed bowl.